Increasingly the primary avenue of recourse for many business disputes is the court or before arbitration panels. Our paramount concern is the end result for our client and we candidly assess the benefits and risks of litigation at the outset of every case. Nemelka & Restum attorneys have appeared in city, county, state and federal courts, as well as the Supreme Court. We have over 10 years of experience in more that a dozen counties across the state of Montana. Over the past decade have counseled on over a thousand different cases, which we have successfully litigated with a high success rate on our clients behalf. 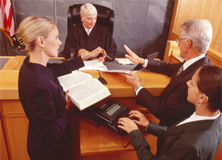 Contact us today to see if litigation is the right approach for you.